Foreign Affairs Minister Chrystia Freeland speaks at a news conference during a meeting of Women Foreign Ministers in Montreal, Saturday, September 22, 2018. 22 Sep 2018 – Canada will create a new ambassador position dedicated to women, peace and security, Foreign Affairs Minister Chrystia Freeland said today. 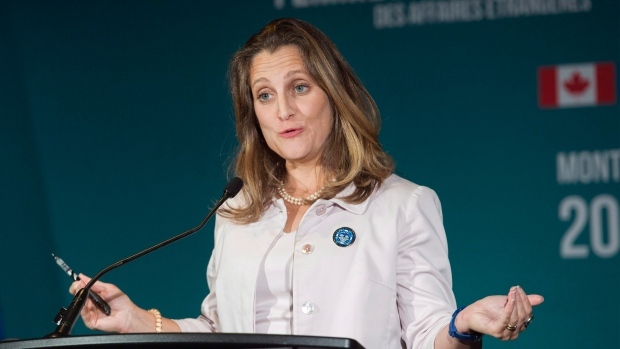 Freeland made the announcement at a meeting of female foreign affairs ministers in Montreal that she co-hosted with Federica Mogherini, the high representative for the European Union. Freeland did not offer many details but said the new ambassador would help champion feminist-based aid programs and advocate for more female participation in peacekeeping and conflict resolution. “International and domestic civil society committed to feminism has been telling us that Canada needs to be even more ambitious, and one way to do that is to have a high-level champion for these issues,” she said during her closing remarks. Freeland also confirmed Canada would spend about $25 million to fund a number of initiatives aimed at combating gender-based violence and promoting women’s participation in peace processes, and would co-chair a global network on women, peace and security with Uruguay in 2020. The two-day summit brought together at least half of the 30 women who hold foreign affairs portfolios globally, as well as Japan’s foreign minister, who is male, and civil society actors. Mogherini said the meetings touched on many issues including conflict prevention, combating gender-based violence, and sustainable development goals. The summit is believed to be the first official summit of female foreign affairs ministers, but she said it wouldn’t be the last. Mogherini said the group will keep in touch and is planning to meet again next year, just before or after the annual session of the UN General Assembly. “Without establishing formal networks or organizations, we will simply work as closely as possible together to advance a foreign policy agenda that makes sure the world uses the full potential of its entire population,” she said. And while the meetings will continue, Mogherini said future iterations may not be as formal, or run under the exact same format. She also highlighted the presence of Japan’s foreign minister, Taro Kono, pointing out that male ministers were also invited to take part. “We do not want to create a separate box,” she said. Following their closing remarks, Freeland and Mogherini were expected to lay flowers at a memorial for the 14 female victims of the 1989 Polytechnique shooting.